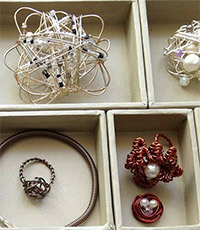 Betty Ching, Hackspace member and jewellery designer, will teach you how to create a selection of wire jewellery items to take away. At a minimum, you can learn to make a pair of earrings, a ring, a bracelet, and a pendant. All components will be silver-plated and comply with current UK allergy legislation. All materials will be supplied, including a detailed instruction booklet, and there will be an option to buy your own set of tools for £18 on the day. The workshop starts at 1pm, and tickets are on sale now for £30.73, including Eventbrite fees.